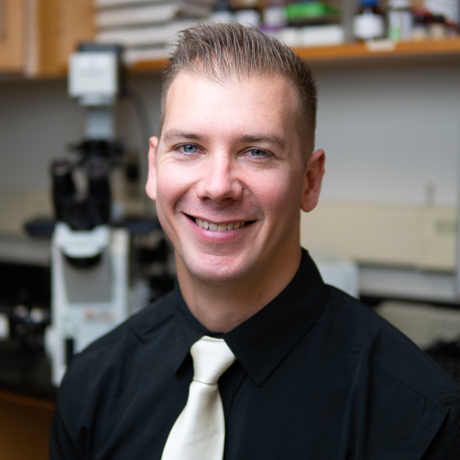 Dr. Keenan studies glass, ceramic, polymer, and composite materials, and designs these materials to elicit therapeutic effects upon implantation in live tissue. Prior work included thorough characterization of a gallium-containing bioactive silicate glass series, along with in vitro biological evaluation of these glasses against fibroblast, osteoblast, osteosarcoma, and myeloma cells, and bacterial and fungal testing. Additional prior work included the development of composites of polymer hydrogels and bioactive glass particles for delivery of therapeutic ions, and these materials were also evaluated through in vitro cell viability analysis and bacterial and fungal testing, demonstrating great potential for in situ anti-fungal properties. Current work is focused on the inclusion of phosphorous and other constituents into these glasses and composites, in an attempt to increase the rate and efficacy of in vitro hydroxyapatite deposition while enhancing their anti-bacterial and anti-fungal properties. Additionally, work is being conducted to synthesize the bioactive glass compositions described in the international standard ISO 23317, and conduct concurrent studies with these glasses for comparison against the experimental glass compositions. A second topical area is the development of more rigid, naturally-derived, functionalized polymers for use as scaffold and sealant materials in bone void-filling applications. Additional areas of interest include the functionalization of structural ceramic surfaces for improved adhesion of polymeric coatings, and additive manufacturing (3-D printing) of ceramic/glass/polymer composites for biomedical applications. Keenan T.J., Placek L.M., Hall M.M., and Wren A.W., “Anti-Bacterial and Anti-Fungal Potential of Ga-Bioactive Glass and Ga-Bioactive Glass/Polymeric Hydrogel Composites” Journal of Biomedical Materials Research Part B: Applied Biomaterials, 105(5), p.1102-1113 (2017). Keenan T.J., Placek L.M., Coughlan A., Hall M.M., Wren A.W., “Structural Characterization and Anti-Cancerous Potential of Ga-Bioactive Glass/Polymeric Hydrogel Composites” Carbohydrate Polymers, 153, p. 482-491 (2016). Keenan T.J., Placek L.M., Keenan N.L., Hall M.M., and Wren A.W., “Synthesis, Characterization, and in vitro Cytocompatibility of Ga-Bioactive Glass/Polymeric Hydrogel Composites” Journal of Biomaterials Applications, 31(4), p.553-67 (2016). Keenan T.J., Placek L.M., McGinnity T.L., Towler M.R., Hall M.M., and Wren A.W., “Relating Ion Release and pH to in vitro Cell Viability for Gallium-Inclusive Bioactive Glasses”, Journal of Materials Science, 51(2), p. 1107-1120 (2016). Placek L.M., Keenan T.J., Laffir F., Coughlan A., and Wren A.W., “Characterization of Y2O3 and CeO2 Doped SiO2-SrO-Na2O Glasses”, Journal of Biomedical Glasses, 1, p.159-172 (2015). Placek L.M., Keenan T.J., Li Y., Yatongchai C., Pradhan D., Boyd D., Mellott N.P., and Wren A.W., “Investigating the Effect of TiO2 on the Structure and Biocompatibility of Bioactive Glass”, Journal of Biomedical Materials Research Part B: Applied Biomaterials (2015). Wren A.W., Hassanzadeh P., Placek L.M., Keenan T.J., Coughlan A., Boutelle L.R., and Towler M.R., “Silver Nanoparticle Coated Bioactive Glasses – Composites with Dex/CMC Hydrogels: Characterization, Solubility, and In Vitro Biological Studies”, Macromolecular Bioscience, 15(3), p.1146-1158 (2015). Alhalawani A.M.F., Rodriguez O., Curran D.J., Co R., Kiernan S., Arshad S., Keenan T.J., Wren A.W., Crasto G., Peel S.A.F., and Towler M.R., “A Glass Polyalkenoate Cement Carrier For Bone Morphogenetic Proteins”, Journal of Materials Science: Materials in Medicine, 26(3), p. 1-9 (2015). Wren A.W., Keenan T., Coughlan A., Laffir F.R., Boyd D., Towler M.R., and Hall M.M., “Characterisation of Ga2O3-Na2O-CaO-ZnO-SiO2 Bioactive Glasses”, Journal of Materials Science, 48(11), p.3999-4007 (2013). Kucko N.W., Keenan T., Coughlan A., and Hall M.M., “Fill Volume as an Indicator of Surface Heterogeneity in Glass Vials For Parenteral Packaging”, Journal of Pharmaceutical Sciences, 102(6), p.1690-1695 (2013). U.S. Provisional Patent Application No. 62/412,299, “Devitrification Resistant Compositions”, Filed on: 10/25/2016 by Conax Technologies LLC. Co-Inventors: T.J. Keenan, L.M. Placek, and M. M. Hall. U.S. Provisional Patent Application No. 62/364,711, “Devitrification Resistant Coating Compositions”, Filed on: 7/20/2016 by Conax Technologies LLC. Co-Inventors: T.J. Keenan, L.M. Placek, and M.M. Hall.